Home › News & Articles › Reports › Claessens Ludo, "The 'miracle man' from the border region"
Claessens Ludo, "The 'miracle man' from the border region"
We went to Putte (Holland) somewhere halfway October. Putte is located about 1 km passed the border where Putte-Kapellen borders on Holland. Putte-Kapellen is well enough known in the cycling world because every year, the professional cycling season is concluded here on Belgian soil. We were two days early to see the race but, in the end, we hadn't come to Putte to see the race. 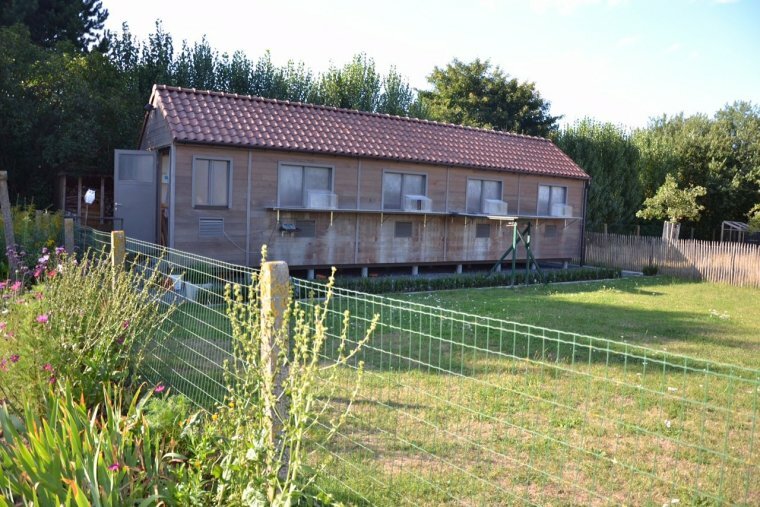 We crossed the border and visited the Dutch pigeon expert' and the wonder loft' of Ludo Claessens, who is maybe the best middle distance racer in the world' at present. 2006 was one of his best, if not thé best season of his entire pigeon career... about time we went and checked how things in this wonder colony' are at the moment. We were also eager to get to know the man who is behind all these top successes. People say he is not just anyone' in pigeon sport. Ludo immediately made clear that he's indeed not just anyone: he wasn't interested in a commercial report. He cares a great deal about his privacy... pigeon gazettes, pigeon books or websites can publish reports about him but solely if they are related to his performances in pigeon sport. He is not interested at all in commercial publications. He doesn't care about luring customers (i.e. 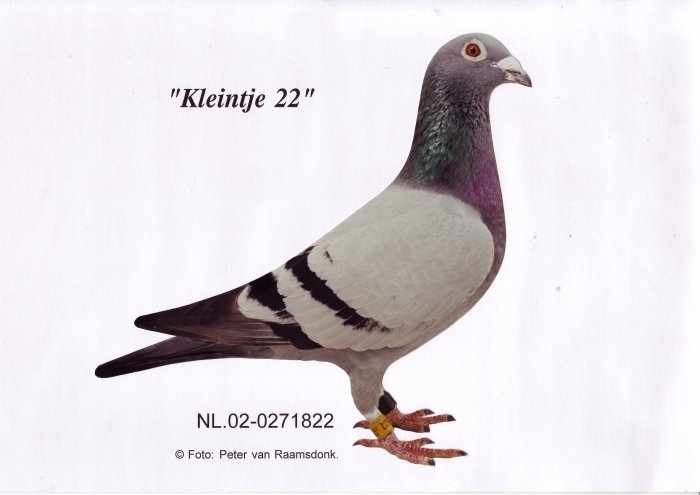 buyers) with a facsimile, a website (both of which he doesn't have) or any other way of publicity... he is solely interested in telling the world about his pigeons and their performances... Only real pigeon sport' counts... which is exactly the reason why we went to Putte, Holland. We had a 3-hour chat and Ludo (who is by the way a Dutch Belgian) did not mince his words. He gave us an honest explanation to everything and was able to confirm every quote with results which he promptly put on the table'. No nonsense, no beating around the bush, but straightforward... and that's exactly how we like it. Ludo Claessens's motto is quite right indeed. And he's been proving that fact for many years in a row. Ludo simply wants to enjoy the game' pigeon sport. But keeping pigeons implies a certain daily grind and work and he isn't prepared to deal with that...! He likes to control things closely. Ludo forms a team with his best friend Rik Kerstens who lives about 100 metres away from Ludo and they only participate in speed races as the team Kerstens-Claessens'. Rik and Ludo have one thing in common... they prefer to keep pigeons in small numbers... and they both like winners! Rik keeps about 9 speed racing pigeons while Ludo focuses on middle distance races. He specialises in distances of 100-400 km and enters for one long distance race at the end of the season. He races 20 widowers at most and has about 10 breeding couples but considers the latter to be a bit of a burden lately, because they simply sit around and do nothing. He gives an example: this spring (i.e. 2006), they only raised one round of youngsters... Ludo wonders why he is providing them with board and lodging all year through? As we mentioned above: raising youngsters in order to sell them doesn't interest Ludo at all... hence the magical number 60': 60 pigeons get the opportunity to winter in his loft! 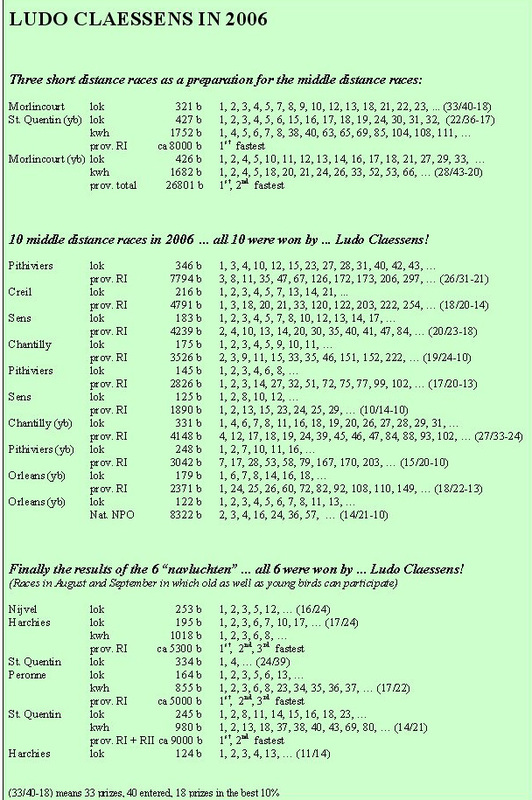 Who dares to argue with a phenomenon' such as Ludo Claessens? The incredible results he achieves year after year prove that he's right. Are we exaggerating? Not at all... in our opinion, we're expressing it mildly: let's take a look at the list of achievements of the past season of 2006, which was maybe even the best season' ever in Ludo Claessens's 30-year career. He's rarely missed a 1st prize on local level... so he sure is entitled to speak. Are you convinced? You're probably wondering whether top quality, or rather: the top quality of the loft of Ludo Claessens is natural? Probably not when you consider the common pigeon fancier... but this top quality is apparently self-evident at Ludo Claessens's loft. Ludo has been handling top pigeons' for over 30 years now. After all this time, top quality has become common practice. Ludo's pigeons have to pass a severe selection procedure every year and thanks to that, his colony has become a true pigeon family! Does he ever reinforce his colony by crossbreeding other pigeons with his main breed'? Ludo says: During the last 10 years, only an extra ten pigeons were acquired. The latest acquisition is Mr. TOURS', winner of 1st National Tours NPO.' In a report that had been published about this pigeon, Ludo read about 2 different fanciers: each of them had obtained an egg from Mr Tours'. Both of these young pigeons became top racers... He concluded that Mr Tours' had to be a real top breeder'. Mr Tours' immediately appealed to Ludo so he went to take a look at this pigeon and as you might have guessed: he took Mr Tours' along with him to Putte! But we slightly deviated from the posing. In our opinion however, the answer is pretty easy. 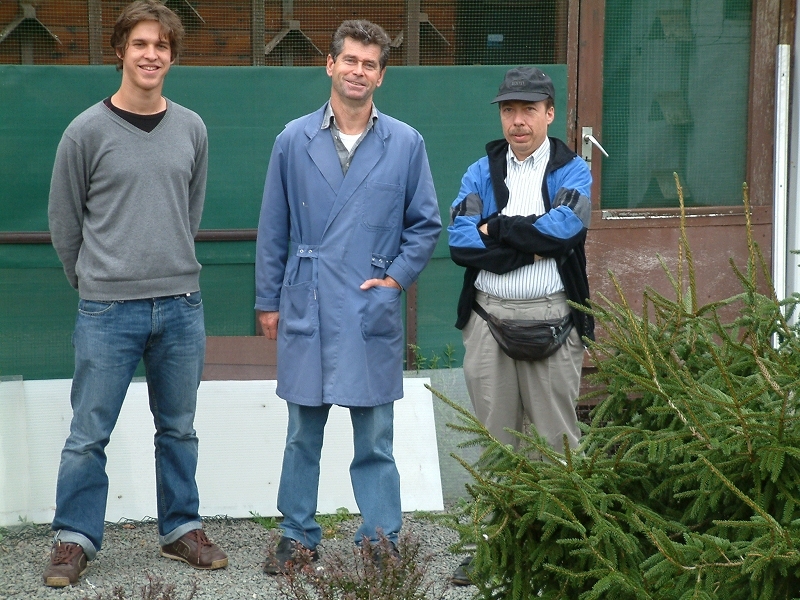 For many years now, Ludo Claessens has been racing pigeons on a very high level. 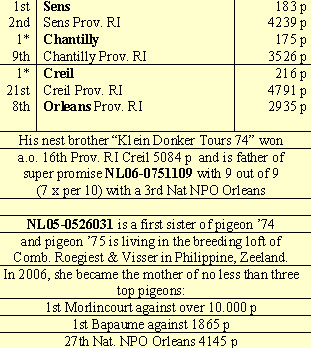 If you'd check the individual lists of achievements of the Claessens pigeons, you'd have to conclude that they are way ahead of the competition. Ludo simply gets a kick' out of 1st prizes: a weekend without winning a 1st prize is a lost weekend' to him and he considers it to be a failure! He is not interested in ace pigeons and so on, only the individual achievements of a pigeon matter. Ludo explains why... A pigeon of Ludo's friend and fellow villager became 6th National Ace Pigeon Middle Distance this season. Ludo confronts us with the results of this pigeon in the races of 2006 without spoiling the effect of these achievements of fancier and pigeon (who is by the way a real crack)... To all' results that were taken into account to win this title of 6th National Ace Pigeon, Ludo Claessens simply had at least 5 pigeons ahead! Quite a feat! 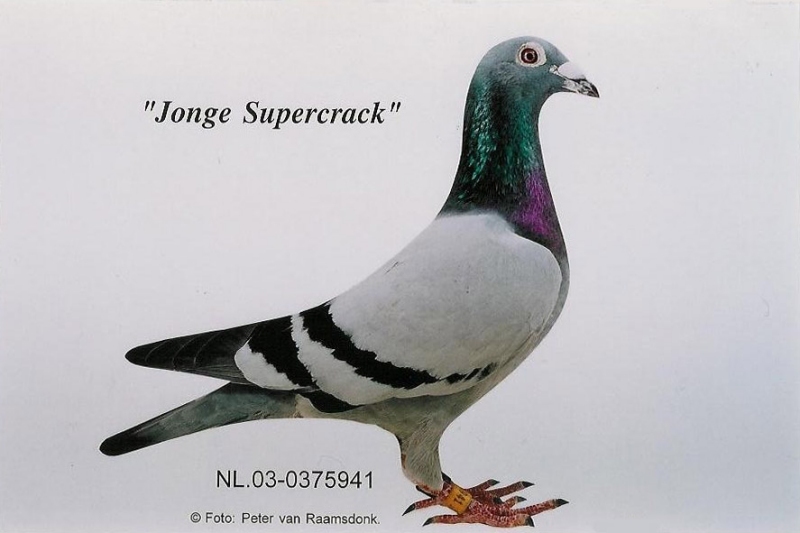 Dik Licht 56'... Late Donkere'... and I should also add Supercrack 69', although -on second thought- this pigeon is a pure inbreeding product of the main pigeons mentioned above. 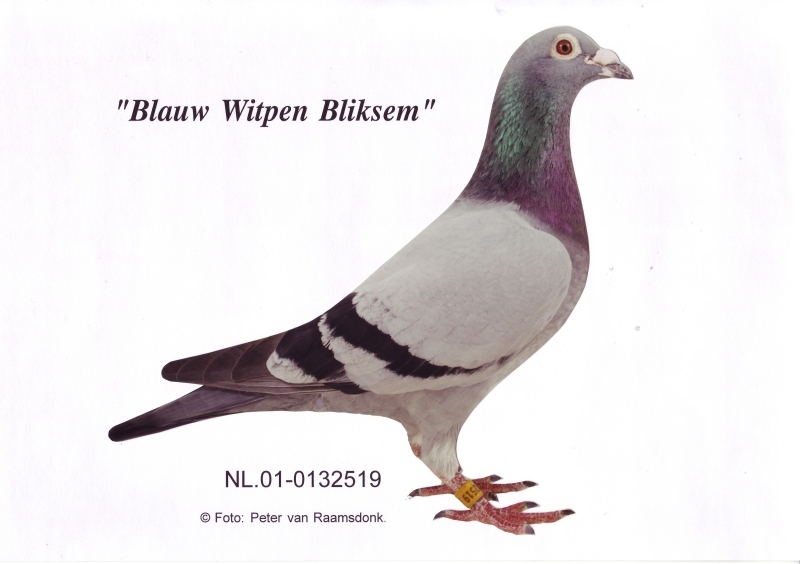 Other pigeons that have successfully contributed were Oud Blauw Slaets'... Blauw Verheyen'... Blauwe 01' and Bliksem' ... Lange Nek Zav' and finally Mr. Tours', who is trying to prove what he's worth at the moment. We tried to figure out the whys and the wherefores. Ludo does not have a fixed system for taking care of the pigeons. He states that every season is different so you have to go along with those changes every year. Changes sometimes imply some adjustments as to feed and support of the pigeons, hence the lack of an established pattern or ritual. The pigeons normally fly 7 or 8 provincial middle distance races per year. We asked him right away whether the birds sometimes get a week of rest? Normally they don't but Ludo immediately adds that a week of rest can sometimes be an enormous boost', a real explosion of shape'! So maybe he will be considering this in the future. Remark noted! etc) and they were tired and thirsty. Ludo immediately thought of an infection that was coming on and he contacted the vet, Mr Mariën, who advised him not to do anything. However, Ludo decided to give his young birds a 3-day-treatment with Ridsol, because it had been a while... 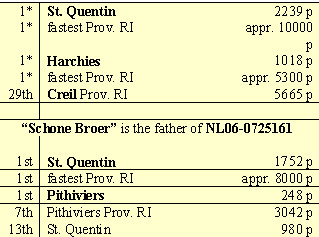 According to Ludo, he obtained the worst' result of 2006 in the following race (Pithiviers). against 3.402 young birds (and yet he had 15 out of 20)! If you go by the name of Ludo Claessens this might be called a somewhat less good performance because there's only 1 real top 10' pigeon... However, the moral of this story is: Ludo realised that a simple, apparently harmless cure, can influence the shape of his pigeons for a couple of days... and a top champion like Ludo is clearly annoyed about something like that. 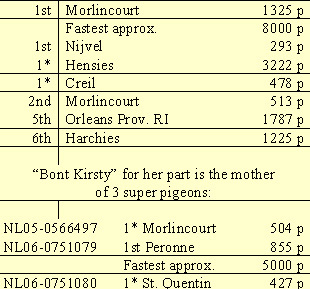 By the way, when the pigeons were basketed for this race (Pithiviers) nearly all the fanciers were complaining about the fact that their pigeons returned home from Chantilly very thirsty and completely exhausted. Ludo realised that there was probably nothing wrong with his pigeons but that this fault was caused by the fact that the pigeons were treated less good while they were in the basket... so he worried over nothing! But this is without any doubt a typical feature of very great champions' such as Ludo Claessens: a sharp eye for every detail... They immediately spot the smallest defect or difference and act on it. Maybe that's the big difference between a super champion' and an average fancier'? We'll have to think about that one! 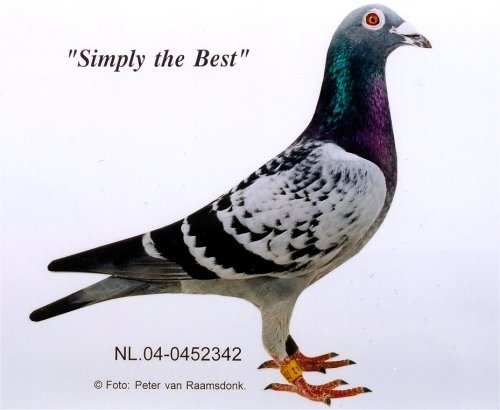 The trademark of Ludo Claessens is of course his colony of phenomenal super pigeons'. The results are the best proof. Ludo gives an appropriate remark on the many reports that appear in newspapers and magazines. Pretty much all of the fanciers talk about their best results per year, so they only mention some results' and not all results'! If you want to be worthy of the name of great champion', you should have the nerve to mention ALL' results of an entire season and above all: have the nerve to publish' good as well as bad results! If you do that as a fancier, the reader will be able to rate the colony at its true value. Ludo suits the action to the word and gives us an overview of ALL THE MATCHES THAT WERE RACED (the good ones as well as the less good) + the RESULTS of the past 3 seasons. 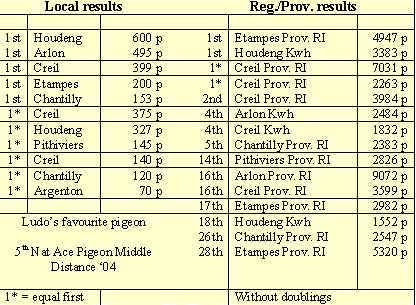 As far as 2006 is concerned, the final conclusion is: 132 nominated pigeons with 109 prizes (per 4), 94 per 10, 38 per 100 and at least the 1st prize on local level every week. Ludo Claessens is most certainly part of the very greatest' of our sport! Figures that are really something! 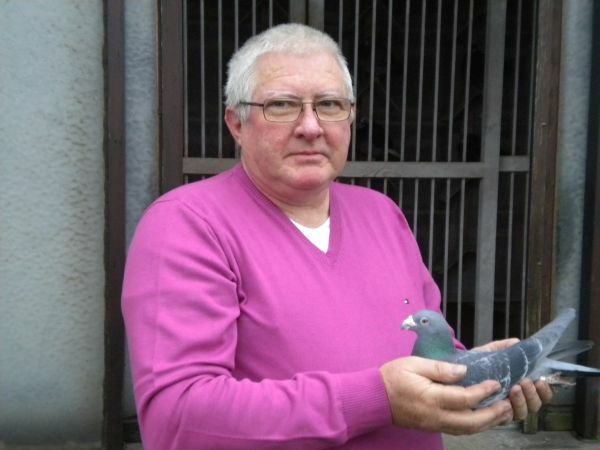 The results Ludo Claessens obtains each year with just 20 widowers and 40 bred young pigeons, are pretty much unbelievable to many pigeon fans. Nearly every old pigeon in the racing loft is a superior 1st prize racer or an exceptional crack pigeon' and that is -by the way- an essential condition to overwinter in Putte. Making a very severe selection every year must be a dream' to many fellow fanciers... yet, in Putte, that's just the way things are. And Ludo does not budge an inch from his philosophy... 60 pigeons get to overwinter in his lofts. The better they are, the more severe you have to be... and putting together new lofts is not an option! Let's illustrate this by taking a look at the present generation of super pigeons' that populate the racing and breeding lofts. (By way of illustration: 1st prizes marked with a *' are equal first' which means that only a loft mate preceded the pigeon; which is the same as winning a 1st prize against the competition!). Many would jump at the chance to breed with such pigeons like SUPERCRACK 69', yet... there are only few of this calibre. Ludo had the chance to have such a wonder pigeon' in his lofts and he has naturally fully used its enormous breeding capacities and raised a generation of real super pigeons' yet unequalled! 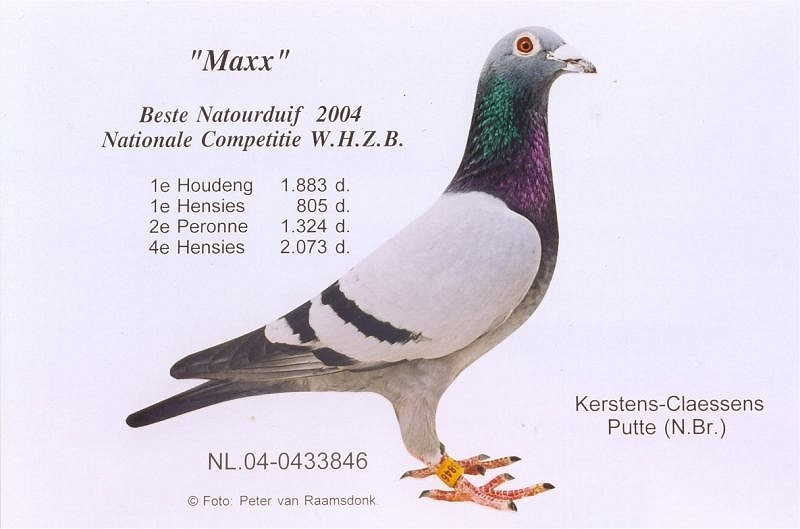 Blauwe Witpen Bliksem' is the grandfather of the superior pigeon MAXX' or the 1st Nat Ace Pigeon Navluchten'* in 2004! The miraculous Bliksem breed' produced a youngster which won the 1st Nat. 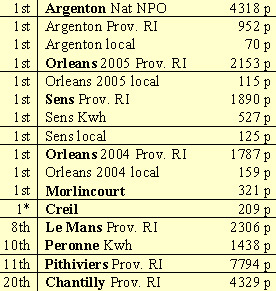 Orleans NPO against 8.322 pigeons in 2006 at the loft of A.Clarijs & Son. He preceded Ludo Claessens himself who won a 2nd+3rd+4th national. 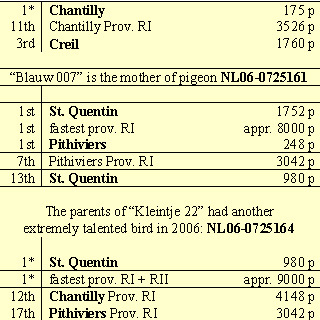 So this means that Ludo was knocked out only by his own kind or maybe we should state that the Claessens pigeons won no less than the first 4 National prizes! Klein Bont 94' NL05-0566494 who became 11th Prov RI Orleans 2.935 p and who became the mother of NL06-0751103 in 2006. The latter performed excellently: it won the 2nd Nat NPO Orleans 8.322 p and obtained an excellent 8 out of 9. NL05-0566495 or the nest sister of the previous who is the mother of pigeon NL06-0751109. 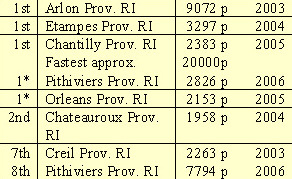 This one won the 3rd Nat NPO Orleans 8.322 p and obtained an excellent 9 out of 9. 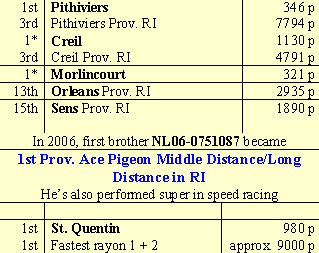 In 2005, a summer youngster -pigeon NL05-0526015- that descended from Kleintje 22' was transferred to the racing team right away and it didn't disappoint his boss at all. He performed magnificently in the last 2 races of the season and obtained 7th Prov RI Montlucon 1.154 p, 34th Nat NPO Montlucon 5.084 p and 25th Prov RI Sens 1.890 p.
A real dream pigeon, a favourite and preferred pigeon of the future of Ludo Claessens descends from this couple: NL06-0751110 and he immediately showed his cards: 1st Morlincourt 1.682 p (also the fastest out of 26.801 p), 1st Hensies 124 p (equal first), 19th Prov RI Chantilly 4.148 p and 28th Prov RI Pithiviers 3.042 p. This is clearly one of the success breeds of the Claessens' lofts and he's only just begun. 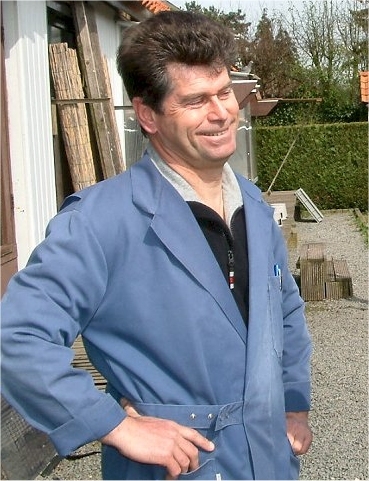 A true miraculous breeding line in the lofts of Ludo Claessens: Kleintje 22'! Jonge Supercrack' got a new hen in 2006: Klein Bont 94' NL05-0566494 (by the way: she is the daughter of the above mentioned Kleintje 22') and they became the parents of NL06-0751103 or the winner of 2nd Nat NPO Orleans 8.322 p. In short, this is a family of miraculous top pigeons. 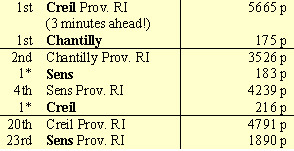 Naturally, expectations for the long distance classic to close off the season (Montluçon in 2006) ran high. The sun was shining, the sky was steel blue and it was sizzling hot... and Simply the Best' feels on top of the world in such weather conditions. And yes indeed, the first pigeon that checked in was Simply the Best' together with an unfamiliar young pigeon. He flew his lap of honour and dived (in the company of the young pigeon) for a pond which is situated in front of the Claessens's lofts. Ludo thought that they were thirsty and hurried to the pond in order to guide his pigeon to its loft. Simply the Best' caused quite a stir when he suddenly bloated: both of his legs were broken. He flew to the ridge of the roof of a house across the street (the same roof where he sometimes comes across a foreign hen during the week when he trains). So he was on familiar ground... He lied there for 30 minutes before he stumbled in and obtained a pretty early prize. Double bad luck: Simply the best' broke his two legs but afterwards it appeared that he could have won the 1st National NPO Montluçon another time with flying colours and repeat his stunt of 2005. This would have been -without any doubt- a truly unique performance. In the meantime, the wonder pigeon' is back on its feet again but Ludo will have to wait and see whether this incident will be a heavy burden on the future sports career of this pigeon.